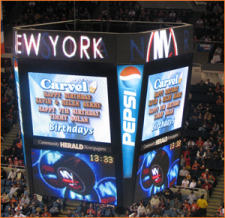 Ensure that Your Video Board Messages are Legit! Fans always enjoy the typical in-game video board messages and on-court proposals... But what do you do when one of your fans stages one of the biggest pranks of all-time? Check out the link below to see how Amir of CollegeHumor.com, aka Yankee Prankee, used video board messaging at the New York Yankees game to ruin his friend's experience at the ballpark... and maybe even his relationship. This is a great video for all properties to watch to ensure that measures are implemented to avoid this ever happening at their venue! The stunt was so good, it received media coverage on TMZ and Good Morning America. When the Red Sox Win, You Win?